Location: Williston Lake in the Peace River Alaska Highway region of Northern BC, is the largest lake in the province of British Columbia. 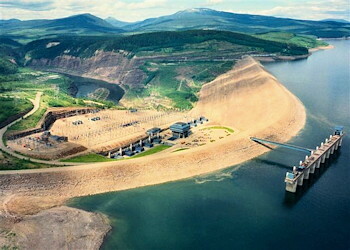 This man-made lake was created when the large hydro electric project, the W.A.C. Bennett Dam was built in 1968. 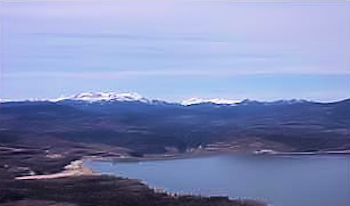 Williston Lake, is the dam reservoir, and is in part three different rivers, the Peace, Parsnip and Findlay. Road access to the Peace Reach is via Hudson's Hope and the W.A.C. Bennett Dam. Road access from Mackenzie to the Parsnip Reach and Finlay Forks is via the Parsnip West Forest Service Road on the east side of the reservoir. Access to the west side of the Parsnip Reach is via the Finlay Forest Service Road. Williston Lake covers an area of 250 km (155 mi.) in the Rocky Mountain Trench, providing hours of pleasure to boaters and fishing enthusiasts. Rainbow Trout, Lake Trout, Kokanee, Dolly Varden, and Northern Pike can all be found in the rivers and lakes of Peace River Valley, including Williston Lake. There are municipal and private camping sites at both Mackenzie and Hudson's Hope. Boating, swimming, water skiing, fishing, photography and exploring are all activities that can be enjoyed on Williston Lake and surrounding area. There are also a number of provincial parks on the shore of the lake. They include Muscovite Lakes, Butler Ridge, Heather-Dina Lakes, and Ed Bird-Estella. Williston Lake Resort - Williston Lake Resort is situated in the foothills of the Northern Rocky Mountains, on the shores of the largest reservoir in Canada. Whether your crave backcountry adventure, or family memories that will last a lifetime, we�ll help you make the most of your holiday.